I don’t have a strong background in art. I was raised in the pre-Baby Einstein days, after all. Before my college art history class, I could recognize a Monet or a variety of children’s book illustrators (Mercer Mayer, for instance), but that was my extent of art culture. As I raise my children now, I am in awe of the wee ones’ art knowledge. The other day, Ella told me she was drawing a picture that looked like van Gogh. Holy cow! That child came from me? I think it’s awesome that there are so many resources for bringing art and music into our children’s sphere of interest. Yes, a lot of the credit for our art knowledge goes to the T.V. show Little Einsteins, which we stumbled upon by accident in our library’s DVD collection. Now we don’t leave the library without one, and if we do, well, there’s always Youtube. There are some great books that have made my daughter fascinated by art, too. You’ve probably heard of the Fancy Nancy series by Jane O’Conner and illustrated by Robin Priess Glasser, but did you know that your child will talk to you about Jackson Pollock after reading Fancy Nancy, Aspiring Artist? Or that she will want to cut out shapes and make a picture like the ones by Henri Matisse? (true story). 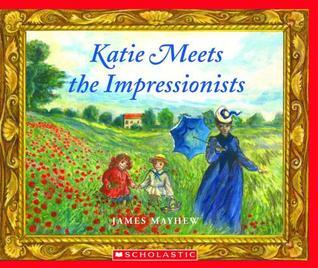 Our favorite book series on art is the Katie series by James Mayhew. It’s about a girl named Katie and her art museum adventures. Our favorite is Katie and the Impressionists, followed closely by Katie and the Spanish Princess. These books give readers a feel for a certain era or style in art. If you’re looking for books about specific painters, I’ve heard great things about the “Getting to Know The World’s Greatest Artists” series. The blog Mrs. Picasso’s Art Room has many more great ideas about books on artists. I’m not set on force feeding art history to my children or anything. It’s something my oldest has become interested in, so I’m going with it. I think it’s fun and I can’t wait until she’s old enough to take really enjoy our city’s art museum. At this point, I’m doing my best to pick out fun children’s books with quality illustrations. I know quality art is often a matter of opinion, and I want my children to appreciate all kinds. But for now, I try to stay away from elaborate stick figures or those books that remind me of that TV show Rugrats. We’re going to stick with Jessie Wilcox Smith, Tasha Tudor, Virginia Lee Burton, and other great artists and Caldecott Medal winners and nominees. What are your thoughts on teaching art to your kids and art in children’s literature? This is a new topic for me, so I’d love some advice. This is Day 8 in the series 31 Days of Picture Books. To see the rest of the posts, go here. Looking it up on my library’s website now! Thanks for the recommendation, Jennifer. No One Saw by Bob Raczka. It’s brilliant in how it weaves art/famous artists into a story of how different artists “see” things. I highly recommend it.